Cinderella didn’t have the privilege of having a dishwasher in her day, but this saved her the trouble of deciphering what each cycle does. If you’re in confusion – a pre-wash crisis one might say – as to what ‘Speed60’, ‘SaniWash’ and the infuriatingly vague ‘Normal’ means, you have come to the right place. 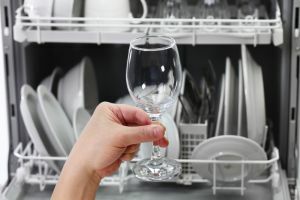 Canstar Blue brings you a guide on what to expect from each dishwasher cycle and what it’s intended for, so you can call us the fairy godmother, just without the wand. 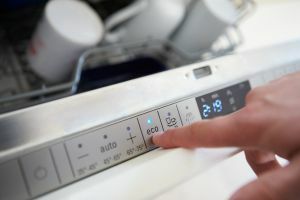 The automatic wash cycle is becoming increasingly common on new dishwashers and might even wipe out all the rest of the cycles in the near future. However, for now not all dishwashers are equipped with this easy, one button cycle – so keep reading. This cycle is stated by manufacturers to detect the level of dirt on your dishes and automatically initiate the ‘optimal’ cycle with regards to heat, intensity and duration. It’s just like Bibbidi-bobbidi-boo and off you go! The temperature typically ranges from 45°C to 65°C. So, for very soiled dishes, it might select a higher temperature while a standard load is likely to choose a lower setting. This cycle might have a different name on your dishwasher – KitchenAid refers to it as ‘ProWash’ while Miele calls it ‘Sensor’. But the good news is, it’s the same and will help take the worry out of your washing up. Fragile dishes, such as glassware, crystal or fine china, require “delicate” care. This cycle typically has a gentle spray to avoid knocking over any items and causing damage. It typically has a lower temperature of around 40°C. It would be wise to check if your priceless dishes are dishwasher safe before you put them on this cycle. It’s also recommended that glassware is separated and doesn’t touch other items in the dishwasher to help avoid chipping. This program might be one that you can live without and it may also be referred to as a ‘light’ wash by some brands. This is claimed to be an environmentally-friendly program, using less water and energy, plus lower temperatures compared to the ‘Normal’ wash. 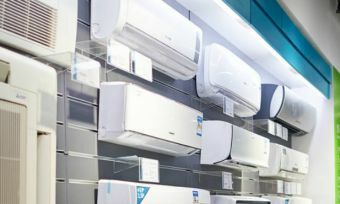 While higher temperatures generally mean better washing and better drying, this also means it will need to use more electricity. With the eco mode, expect lower temperatures of around the 45°C mark, but longer washing periods to compensate. A dishwasher with this mode may also skip heating the plates and utensils to dry them off and air dry them instead. So, to summarise the three main settings adjusted with this program include – temperature, water and time. This wash cycle may sometimes be called ‘Energy-Save’ or ‘Eco Program’. This cycle comes under an array of names but they all fall under the same category. The cycle uses either extra water or heat, or both to get your dishes clean in about an hour or less. So, it shortens the washing time but the specific time period might vary depending on the model. Smeg offers one of the fastest cycles – Ultra Quick 16min – so if you need clean plates pronto, this may be your go-to. The one-hour or less wash cycle is most commonly referred to as the ‘fast program’, but Miele also uses ‘Turbo’, while Delonghi and Esatto go with ‘Rapid’. The most creative one might be from Bosch, which uses the name Speed60. As the name might suggest, this dishwasher cycle is designed for very dirty plates, pans and pots that would normally require soaking. It’s aimed to clean baked-on food and grime by using more water and energy than the Normal or Eco setting. Expect temperatures of around 70°C, however this does vary by machine. Not every dishwasher comes with an intensive program, so you might just need to rinse your heavily soiled cookware by hand first and then you’re good to go with another setting. Similar to previous cycles, the Intensive wash also has other names, such as KitchenAid’s “Heavy Duty”, Bosh’s “Pots & Pans” or Nef’s “Chef” cycle. If you haven’t bothered trying to decipher what the other options do on your dishwasher, then you’ve probably been using this cycle for most of your washing. And for an average load, this might be the way to go. 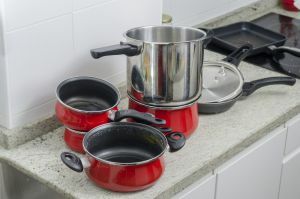 If your dishes and cookware don’t have any particularly tough or baked on foods, this setting for normally soiled dishes should suffice, according to manufacturers. This cycle works without any excessive amounts of water or heat or extra-long wash times to help save on energy. Most machines have programs with a pre-wash or rinse cycle that sprays water onto the dishes to loosen soil particles on the dishes. It won’t actually clean your dishes, it’s simply a way to help prevent food residue from sticking to your plates. That’s why some manufacturers also suggest not to use any detergent when doing a quick rinse. It’s particularly helpful when loading a few dishes and it’s not enough to run a full cleaning cycle. Asko’s name for this program is “Rinse and hold” while Bosch calls it a “Pre-Rinse” wash. Some dishwashers might be equipped with a cycle called SaniWash or an option called SaniRinse. It’s a high temperature program aimed to offer deep cleaning results. Miele says it’s good for sterilising things like baby bottles and cutting boards. It typically lengthens the wash cycle, so you might only like to use this program when you or someone at home is under the weather. Or perhaps if you’re worried about a raw chicken covered cutting board or germ-laden cookware, give this one a try. Fisher & Paykel goes by the name “Sanitise” while Miele uses “SaniWash”. Delay start: allows you to run the dishwasher at off-peak electricity times. You could even set the unit to finish at midnight, ensuring your dishwasher doesn’t turn into a pumpkin. Energy saver: as the name suggests, this aims to reduce the use of electricity by lowering the temperature. It’s also sometimes referred to as the ‘Eco’ wash. Extra dry: designed to provide better drying results in particularly for plastics and harder to dry items. Some machines also have a heating element to assist with drying. It’s sometimes referred to as ‘Long Dry’. Half load: when you don’t have a full load to wash, this setting can reduce energy, water and time. Machine care: is a cycle for your dishwasher, designed to help maintain optimum performance over the life of the machine by removing grime and limescale build-up. It sometimes goes by the name ‘Easyclean’. Timed: ‘30min’, ‘60min’ and ‘90min’ cycles allow you to select a specific time frame. Use shorter cycles such as a quick 30-minute wash for lightly soiled dishes while a longer 90-minute wash is more suited for mixed soil levels. Variable speed: is an option that can reduce the wash time with no impact on wash performance, according to manufacturers. It’s called ‘Variospeed’ with some brands. Variable temperature: allows you to choose different temperatures from low to high depending on how dirty the dishes are. 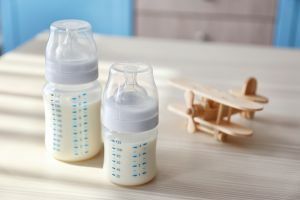 Zoned: some brands have created zones for example there might be an ‘Intensive Zone’ in the bottom basket with a higher water pressure for heavily soiled items. This setting is called ‘Dual Zone’. Dishwashers come with an array of wash cycles and we hope we’ve helped to clear up a few things about what your unit will do once you press that button. If you’re stuck in your usual ‘Daily’ routine, you might be missing out on optimum dishwasher results with other settings. If you’re still in a conundrum over what each option does, one of the easiest ways to find out is to squiz through your user manual. If you don’t have one handy, typically manufacturers have an online PDF copy on their websites. So now that you have the dishes sorted, you can head off to the ball!